To be fair, the Internet fails me on a regular basis. Today, though, the Internet has failed me in a professional sense: I can’t find the clip on YouTube I was looking for. I’m not surfing cat videos during work hours—I’m looking for an online recording of Michael Hurd’s choral work Prayer of St. Francis. It’s incredibly powerful: haunting, atonal and soaring. It echoes with mystery and darkness, and I cannot find a link to a complete file. You’ll have to download it here from the album on iTunes. 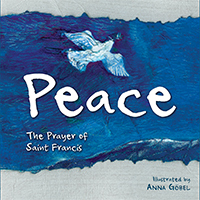 While you’re listening to the song, take a look at one of our new titles, Peace: The Prayer of St. Francis, a book designed by Brazilian artist Anna Göbel. Reading this book in the office was an experience. The first layout designs being printed off gave me the impression of… well, blue. A lot of blue. But when I looked closer at the artwork, it took my breath away. Göbel uses thick brushstrokes and paper that’s been torn, creased and crumpled to add texture to her paintings; the result is a page that you feel like you can almost run your fingers over. She starts with cool underwater blues and greens and moonlight whites, with splashes and then waves of greenish-yellow. The final image, together with the closing verse in the prayer—“It is by dying that one awakens to eternal life”—is a warm, gorgeous sunlit field, in gold and green and touches of orange: a picture of heaven. The people in the paintings are not cardboard cutouts of blond white saints. They are visibly Brazilian, and they are a community: they sit together, they walk together, they talk together. The dove of the Holy Spirit passes between their joined hands and lights up a woman’s face in the shadows. Peace blurs the lines between symbolism and reality, creating a space where the ordinary and the divine are both possible. It’s a beautiful gift to give all readers, both visually and in the rhythm of the prayer’s language. The illustrations and the words reveal the heart of the prayer of St. Francis: “Lord, make me an instrument of Thy peace” becomes “Lord, make me a channel of Thy peace.” Grace is from God, ever present, abundant and overflowing. Not a bad message to pass on—and looking through the pages of the book, there’s no better way than this to put it.